Original Progressive Celtic Music fusing the "trad" with modern songwriting. Lauren Morris and Angelo Miranda formed a songwriting partnership in early 2000 magically clicking with their mutual love for early traditional music and also progressive rock music. Together, they created a unique musical landscape to deliver stellar original storytelling rich with history, heroes, sacrifice and love. From the Soldier's Daughter CD, comes the poignant tale of "William Morris", Lauren's father's service as a Navy Seaman in WWII against the Japanese in the South Pacific. 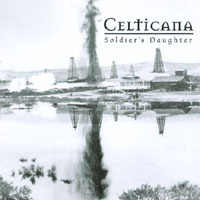 Also from the first CD is the original instrumental "South Bay Jig," Celticana's second CD "Live" features the original progressive pieces, "Love Is Fate," and "Aaron's Song." The song "Oildorado" is a country flavored tune about the oilfields of Bakersfield where Lauren grew up, a real life roots tale. "Soldier's Daughter" and "William Morris" has received international attention and radio play, national critical acclaim and a 100% favorable record reviews commending the group for their songwriting presentation and musicianship. Lauren Morris: Vocals, Guitar, Mandolin, Composition, Arrangements. A native of Bakersfield, she is a flatpicking guitarist as well as utilizing folk, rock and Celtic styles. Her dusky soprano voice is contrasted lyrically by intense stories, and "fused" on a progressive format with dissonant melodies, and multi-voice arrangements. Lauren's stage presence is a cool intensity that serves the music and the spirit of Celticana. Angelo Miranda: Keyboards, Composition, Arrangements. Angelo composed instrumentals such as "South Bay Jig", and co-authored songs with Lauren. His background includes ragtime, bossa nova, country, progressive rock and classical. San Diego credits: The Old Globe Theater Orchestra and several San Diego jazz and bossa nova ensembles. His diversity offers the Celtic music fan the opportunity to hear traditional melodies arranged for piano, sure to please the purist, yet in a style that is only Celticana. Floyd Fronius' violin can be heard on both CDs and is described as significantly soul. Floyd has a gift for melody and can play any style. Celticana's live shows took them throughout the western region playing with such noted Irish acts as Mary Black, Dervish and Cathy Ryan. Later on the group began to feature virtuoso Chris Vitas of Keltik Kharma on vioilin. Chris Vitas has performed with the San Diego Chamber Orchestra, Starlight Theatre, the Old Globe Theatre and the Grand Ole Opry. He performs on albums, CDs, sound tracks for motion pictures, and radio and television commercials. Chris has also shared the stage with such celebrities as Lyle Lovett, Plant and Page, Smokey Robinson, Dionne Warwick, The Moody Blues, Johnny Mathis, Barry Manilow, Frankie Lane, Tony Bennet, David Benoit, Burt Bacharach, and many others. Richard Tibbitts: Wind Instruments, Keyboards, Vocals. Richard is a virtuoso flute and whistle player who doubles on keyboards and vocals. He holds a master's degree in music performance from the University of Michigan. After completing his formal instruction, he began playing traditional music in Germany. He has taught at various community colleges, and has appeared with the San Diego Opera and the San Diego Symphony. David Page: Drums, Percussion. David Page is the maker of the "Total Resonant Drums" used by the Riverdance Company in Ireland. David Page's father was one of the original pipers to come out of Ireland and brought Celtic music to the States. David is a legend in his own time and has played with such greats as Frank Sinatra and Tom Jones. The list of names is simply too long to mention. Duncan Moore: Celticana also uses Duncan Moore on drums. Duncan's credits include Mark O'Connor, Peter Sprague, Nickel Creek and Keltik Kharma among others. to write music with a sound as timeless as the story. All songs on this CD are are well-written, poignant, authentic originals that are progressive in nature, or thoughtfully done traditional Celtic tunes. This group of musicians together form some of the best Celtic-influenced music this side of the Emerald Isle. The result is a bold mixture of tradtional Celtic music, textured by other American musical forms.